Kyle and the 18 crew recently had a tire test at Phoenix International Raceway and two days in one of my favorite places was just too much for me to pass up so I decided to go along! After a grueling hike (see hiking blog) I opted to do some shopping in the nice air-conditioned stores. I have been to Fashion Square Mall in Scottsdale (which is beautiful and has every store under the sun in it) many a times but I was in the mood for some serious bargain shopping so I decided to see if there was an outlet mall in the area. I cannot even tell you if there was because the first store I came across was a place called Last Chance that had many reviews. As I was reading the comments I was laughing out loud, it seriously sounded like a scene out of he movie Confessions of a Shopaholic. People grabbing other people’s stuff, a crowd ready to bust down the door at 10 am, security guards rolling out merchandise and a free for all ensuing. No way could this be true I thought but heck if it is this is right up my alley and I had to check it out! My hike took a little longer then expected so I did not get to Last Chance right on time but got there about 35 minutes after the store opened and already the place was packed! Women and kids were everywhere dragging big, rolling, pull-carts filled to the brim! As I entered further in the store I saw three gigantic bins of purses with women everywhere. Nice looking purses I thought but surely probably not anything too exciting since they were all thrown haphazardly in bins. As I began to approach, two security guard looking men came out with a store worker who had a gigantic cart filled with more purses. All the women were asked to step away from the bins as the worker began to add more purses into the already over flowing bins. By now a crowd of 30 or so women had begun to surround with more pouring in. As the worker finished and said, “have at it”, the crowd pounced. Not to be left out I ran up to the bin too! I grabbed a cute tan purse out of the pile expecting a normal bag. When I inspected it I discovered it was a Marc Jacobs bag! I dug deeper and came across Valentino, Prada and Christian Louboutin purses all originally priced around $900-$1400. At first I was appalled that these beautiful bags were being handled this way then I checked the price tag, a Valentino bag for $150 with an additional 35% off?! Move out of my way ladies, game on! Now I will tell you some of these bags were in perfect condition and others had slight damage. For example the Valentino purse I got had a tear at a seam (hence the reason I was looking for a piece of bright red patent leather if you follow me on twitter). Additionally, the purse I got my mom, a Ted Baker purse for $35, had a strap a little loose. But hey if you are kind of crafty or know someone who can fix it the 90% savings is well worth it! This section is not for the faint of heart or the undeceive. If you set a purse down even if you are debating about it, it is up for grabs by anyone else and will be gone in a flash! I went next to the clothing section. Many of the items are ruined with a stain or tear but if you dig there are some good finds. For example, I found a pair of Paige jeggings for $12 original price well over $100. For Kyle and my brother and dad I found cashmere sweaters for $14.99! So needless to say this place is amazing but you will have to dig and fight your way through their immense selection and be sure to examine each piece for tears or stains. I would go back but suggest bringing a partner so you have someone to help you grab and hold. I do not suggest bringing kids as crazy women running for new purses or shoes being brought out may run them over! It was a blast and an experience at incredibly low prices. I cannot wait to go back to Last Chance when I visit Phoenix in November! Samantha…I’ve been to last chance many times and as long as you check everything out first then your good as gold, the shopping is AMAZIMG!!! Hope that you might come back on Ocotboer the 4th when KB does testing at PIR. Would love to dig with you for another bargin. 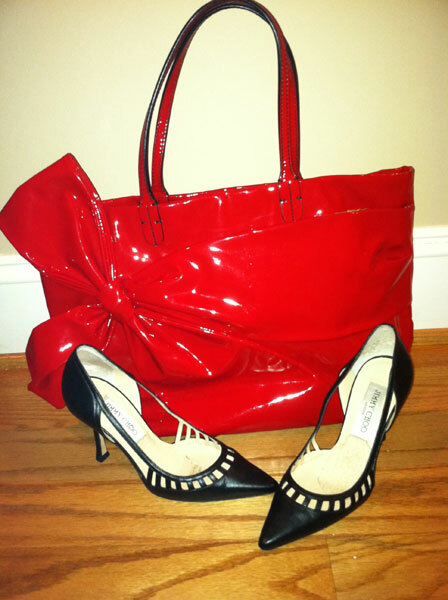 Love those shoes and bag!! Does Last Chance have website?